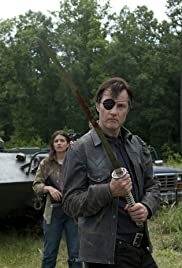 The Governor: Rick! Come down here. We need to talk. Rick Grimes: It's not up to me. There's a council now. They run this place. The Governor: Is Hershel on the council? What about Michonne? She on the council, too? Rick Grimes: I don't make decisions anymore. The Governor: You're making the decisions today, Rick. Come down here. Let's have that talk. What a mid season finale. Plot In A Paragraph: As Daryl finds out about what went down with Carol. The Governor convinces his new friends that it is in their best interests to take over the prison and if needed, use force to do so. Not everyone is comfortable with that approach, but go along with the majority. The Governor and his crew appear at the prison and he has two massive bargaining chips with him. (Herschel and Michonne are his prisoners) He tells Rick to be out by sundown. Rick tries to reason with him, but The Governor is unwilling to listen. In the ensuing battle, their are casualties on both sides. I'm gutted about a major characters death, they will be missed,The entire end credits, plus various production company logo animations, are played in utter silence is very fitting. I'm also still upset about the Carol situation, hopefully she will come back, and be reunited with her pal Daryl. If it were not for the two episodes about The Governor, Thai would have been a flawless first half to the season.